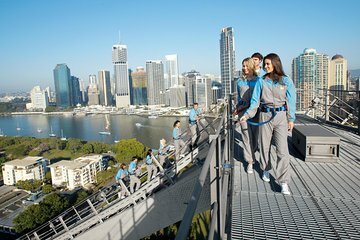 Take your adventurous spirit to new heights on a 2-hour Brisbane Story Bridge Adventure day or night climb. After a safety briefing you'll follow an experienced climbing guide from the central platform to the summit, then cross the width of the Story Bridge. Hear audio commentary about Brisbane's surroundings and enjoy panoramic views of the Brisbane River, Moreton Bay, the Glass House Mountains, distant Mt Coot-tha and Lamington National Park. Bonus: one complimentary group photo of your climb! Start your Brisbane Story Bridge Adventure day or night climb 15 minutes prior to your scheduled departure. Climbs depart every 20 minutes from base headquarters at Kangaroo Point. After your expert guide describes the route and covers all-important safety procedures, you'll be safely attached to the static line. Then set off for the summit of this Brisbane icon, following your guide as your group ascends the eastern side of the bridge. Make your way up a steep incline to a top platform, reaching one of the two high points of the climb, each approximately 262 feet (80 meters) above sea level. Enjoy uninterrupted, 360-degree views of the city skyline, spectacular on a twilight climb, and soak up the panorama including the Brisbane River, Moreton Bay, the Glass House Mountains, Mt Coot-tha and Lamington National Park in the distance. From the central platform you'll traverse the width of the bridge, high above six lanes of traffic. Your 2-hour Story bridge adventure climb ends with the return to headquarters, where you'll receive one complimentary high-resolution group photo of your experience. Great view of Brisbane and the river at night...well worth doing..easy pace so everyone enjoyed the climb. We did the climb in memory of our daughter on the 6th anniversary of her passing. What an amazing way to remember her. The experience was unbelievable and the view was absolutely brilliant. Thank you to our guide Tom and the team at Story Bridge Adventure Clim who made the experience so memorable for us. We did it for Danii 2016! One to add to your bucket list. A must do experience in Brisbane. Simon, our guide, ensured that we had an awesome time climbing the bridge and gave us lots of information about the bridge history and general information about the city. The climb was all that was expected and a totally fabulous experience - highly recommended for anyone to do. It must be awesome at night. Very professionally done and staff were excellent. No complaints at all.